These new display screens will be rolled out in bus stops and at heavily trafficked intersections around the city. Photo by Erik Weber. In the American capital, pedestrians and transit riders will soon be enjoying a veritable buffet of information about their transit options, available on digital displays across the city. District Department of Transportation (DDOT) Director Gabe Klein unveiled on Monday a new multi-modal information screen, a prototype for those that the department will be placing in bus shelters and at major pedestrian activity centers throughout the District as early as this spring. The new displays, some more than a meter wide, will combine information about D.C.’s two bus systems—Metrobus and the Circulator—Metrorail, Capital Bikeshare, and ZipCar, a car sharing service. This information is presented in a simple, visually appealing format, along with an area map and weather forecast. D.C.’s new displays, which are being funded by a TIGER grant from the U.S. Department of Transportation, are a part of a larger trend across the globe to provide easy access to transportation information for city dwellers. In D.C., as in many other places, the intention is that by giving people more information, more often, and more easily, they will make better choices about their mobility. The concept is basically an extension of “rational choice theory,” which says humans make rational decisions to maximize utility, assuming they have perfect information about the available choices. “Bounded rationality theory” recognizes that people have neither the information nor the cognitive capacity to consider all of their available choices, but it acknowledges that we can increase utility by increasing the information we use to make decisions. Public transit often suffers from several downfalls of perception—unfamiliarity being one of them. Infrequent or non-riders avoid transit because much or everything about it is unfamiliar. They don’t know where the bus goes, what time it comes, how much it costs, where to transfer…the list of questions goes on and on. Most of them choose to drive, or take a taxicab, instead. These people often make a less than optimal decision, according to bounded rationality theory, simply because they lacked the information to choose the best travel option. This unfamiliarity is what transit agencies struggle against everyday as they look for better ways to depict their route maps, timetables, wayfinding and other user information systems. But many of these ways of communicating information are internal to the system. Agencies and cities need to find ways to reach customers, both current and potential, outside the confines of the bus, the train or the station. The DDOT displays will do just that. The first prototype has been placed in a street-level window of the D.C. government’s Reeves Center, which is located at a major pedestrian intersection in the rapidly gentrifying U Street neighborhood. The intersection is served by eight Metrobus routes and a Circulator, and is located one block from a Metro station. There are four bike sharing stations and some half-dozen car share vehicles at five locations, all within three blocks of the Reeves Center. 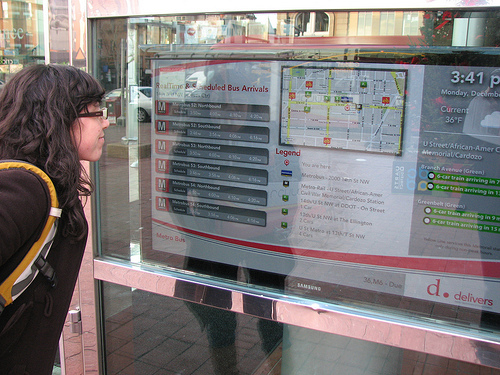 Transit riders can find a range of local information, from weather updates to transit route maps. Photo by Erik Weber. On the display, people can see real-time information for every mode on the map: arrival times for each bus route and Metro line, bike and dock availability for each bike share station, and vehicle availability for each ZipCar location. A news ticker along the bottom streams local news and any Metro, Circulator or Metrobus service disruptions. The software behind the displays is still a work in progress, said Director Klein and DDOT Chief Information Officer Lance Schine at the press conference. Currently the bus arrival times only display the route number and direction of each bus—not much help to someone who doesn’t know which bus they need, or who does know, but isn’t sure whether they should be going north or south, east or west. The next update will change that, Klein said, adding the destination of each bus. Additionally, DDOT will be trying out different map layouts for displays that are not placed directly in bus stops, to better indicate where the closest stops for each route are located. Google will soon be improving their map imagery, Schine said, around the same time that WMATA is expected to begin feeding their route and schedule data into Google Transit, and that should offer more options for the area maps. While DDOT’s approach is extensive and highly polished, it’s also rather expensive—the prototype costs around $25,000 and future displays may run as high as $20,000 a piece. This kind of investment is not an option for many cities around the world. Fortunately, other people are tackling the information problem, as well, aiming for cheap and easy options. At Rail-Volution in October, Chris Smith of Portland Transport presented his “Transit Appliance,” which combines open data, open-source software and open hardware to create a simple and cheap transit information display. For $179, businesses like restaurants, bars, hotels, and others can purchase the small device and connect it to an existing Wi-Fi connection to pull up open transit data. The World’s First “Transit Appliance” from Streetfilms on Vimeo. The expansion of Google Transit to cities around the world and the proliferation of transit apps on smart phones have made significant inroads in increasing information availability and narrowing the familiarity gap between driving and more sustainable options. Still, most of these tools require users to have taken a very active interest in public transit prior to use. Many of these apps also feature only one mode, requiring users to have different apps for the bus, Metro and bike sharing. Interfaces like DDOT’s also recognize the importance of integration, stressing all transportation options as one large complementary system rather than competing modes. 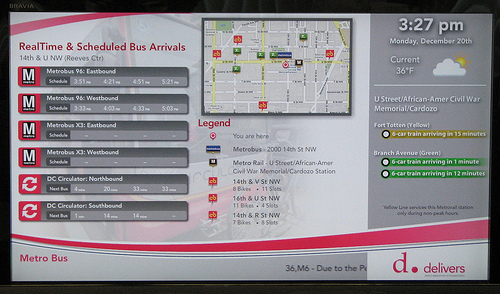 Public information displays such as Smith’s Transit Appliance or DDOT’s multimodal displays help people understand the availability of transit options by making information available and ubiquitous. The more information people have around them, the more likely they are to change their behavior. While it may not change people’s travel choices the first time they look at it, people may choose to leave the car at home on their next trip. Are Transportation Agencies Actually Reading What's Said Online? Tags: DDOT, innovation, mobile apps, open data, smartphone, technology, United States, Washington, D.C.